Hauling your own lunch to work or out on an adventure is always more cost effective for your budget compared to eating out. In fact, you’re more likely to eat healthier foods when you bring your own snacks along on the road. When you want to keep your lunch cool, however, it’s time to look into a cooler. You aren’t limited to a bulky, hard-top container that takes four people to haul out to a site either. Today’s lunch coolers are soft bags in compact sizes. As you take a look at the available products out on the market, you’ll be greeted by numerous features. Consider which features are the most important for your needs, and the best lunch container will makes itself known. With four different colors to choose from, the Titan Zipperless product by Arctic Zone is a true winner. This container is both attractive and functional, which makes it a first-place winner among all of the other coolers. It’s deceptively simple from a first glance, however. You’ll notice a top flap and outer pocket along with a sturdy, shoulder strap. Don’t let the simple appearance fool you, however, because this product can compete with some of the hard-top models that are much more expensive. Explore the features in this cooler, and you’ll be a fan in no time. The manufacturer made their product with durability in mind. The container has Rhino-Tech technology, which is a patented term for water and stain resistance. If the bag becomes wet from splashed water on an outdoor trip, your food won’t become a soggy mess. The cooler will simply slough off the moisture and dry almost immediately. Stains are quickly wiped away with a towel as well. Don’t worry about the sun’s rays damaging the bag either. Arctic Zone constructed their product with UV resistance, which allows it to sit in the sun without fading or breaking down. These basic features alone are often enough to tempt consumers into buying this design. Take a look inside the cooler, and you’ll be greeted by a liner and shelf. The manufacturer refers to their liner as a HardBody because it can be wiped clean after each use without any damage to its surface or seams. Place your heavy drinks on the liner and add the SmartShelf on top of them. This ingenious shelf is meant to hold your delicate items, including sandwiches and chips. You can hike all day, and your food will be perfectly preserved when you’re ready to take a break. As you close up the food within the cooler, you don’t have to fumble with a zipper. This common product feature is often a frustrating one because the zipper can become stuck or break altogether. Arctic Zone is different, however. The lid simply closes down on the lower section and remains in place. With one simple lift of the lid, you have access to your food and drinks without any zipper problems. Most lunch containers have a front pocket, but it’s made of basic material that’s not insulated. This bag is different because the manufacturer knows that even these pocket items still need to remain cool. The Titan cooler comes with an insulated front pocket. Access it with a side zipper, and you can snack on cool items in a flash. Add yogurt sticks or string cheese to this pocket, for example. They’ll be just as cool as the interior section in many cases. If you’re looking for a large cooler, this product may not fit your needs. Some consumers have stated that the Titan cannot support standard-size ice packs. You’ll need to buy small-size types in order to fit them snugly into the container. The Titan measures 6-inches wide, 11-inches long and 10-inches deep. For a standard lunch and small ice pack, these dimensions are ample enough. Arctic Zone advertises their Titan product to hold ice for up to 48 hours. This time frame is possible because of the specialized insulation. The manufacturer adds high-quality insulation with a patented design to the walls. Look at the cooler’s base, and you’ll see that it’s much thicker than other products. Three layers make up the base with a radiant heat barrier covering the entire product. Exterior heat won’t permeate this design. Don’t forget about the adjustable shoulder strap. This feature has a unique design that keeps the bag balanced along your side. As a result, your back and shoulders will feel comfortable hauling around your lunch all morning long. Some consumers have noted that this cooler doesn’t hold its temperature as well as advertised. To combat this issue, it’s important to verify if the lid is perfectly closed. The zipperless lid has an edge that extends down into the container. If the edge is crooked and not aligned with the cooler’s main body, cool air will escape. Simply close the bag with care after each use. You should notice that the ice will last much longer as a result. 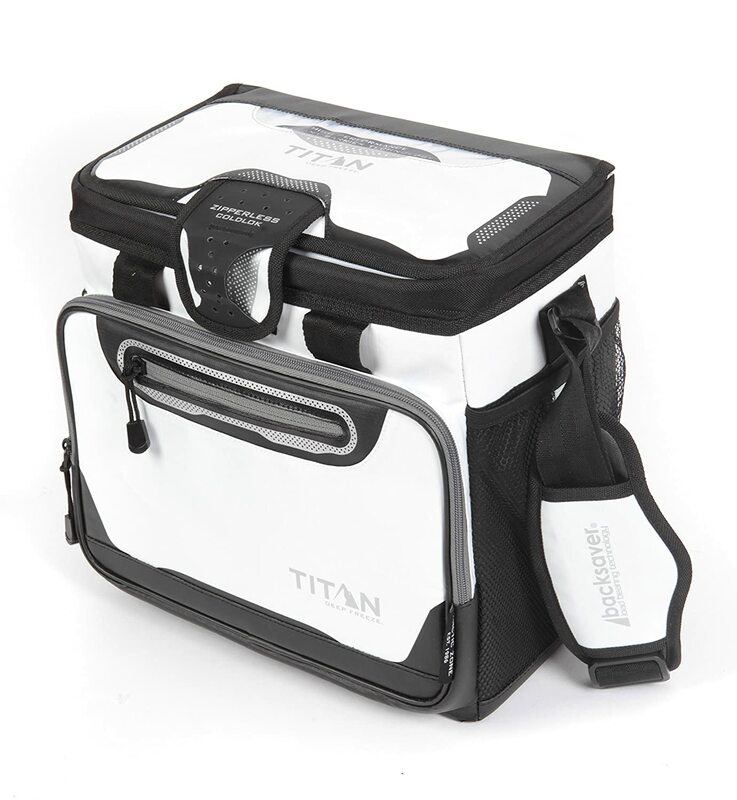 The Titan cooler will serve you well with each outdoor adventure. 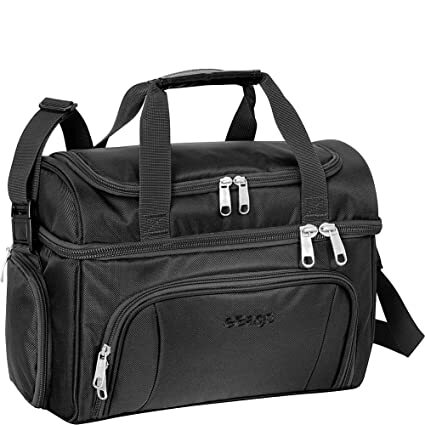 A close runner-up to the Titan bag is the Crew Cooler II by eBags. This bag hides a host of different features that often surprise the most experienced bag enthusiasts. As you explore this product, you won’t believe how many different sections are open for various storage uses. In fact, airline personnel are often seen with these bags as they go about their workday. Take a cue from the professionals, and explore this bag before you buy any other product. eBags has placed a lot of thought into this cooler. Take a look at the product’s interior when you first explore it. The main compartment is zippered with two pulls. It’s referred to as the cold section where you place all of your perishable items. The liner has welded seams, which contributes to this bag’s durability. You can even contact the manufacturer for a replacement liner if there’s ever a problem with it. Surrounding the liner is the bag’s insulated structure. The product isn’t limited to just four sides being insulated because the design calls for all six sides to be protected. Heat can penetrate any uninsulated area, and the manufacturer made sure that every side was covered in quality protection. It’s frustrating if you have many other items, such as napkins or beef jerky, that don’t require a cold-storage period. eBags offers a solution with their hidden, top compartment. Within the lid is a zippered area that allows you to stow away these so-called “dry” items. Pull out your napkins and a cool drink, and you have a relaxing break during work or an outdoor adventure. You’ll be surprised to find other storage compartments along the bag’s ends. Unzip the small, side pocket to reveal a water-bottle holder. In fact, both sides of the bag have this feature. Save the interior space for other cold items while reserving your water for the exterior ends. Because you’re more apt to pull out the water more often than other items, this feature is clever for healthy hydration all day long. 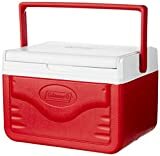 Other coolers have outstanding insulation and pockets, but not enough space for your normal lunch items. The Crew Cooler II is different because you can fit both your food, drinks and ice packs in the center section. Consumers report that they can add a standard-size ice pack, their rectangular Tupperware and drink into the bag with no problems. Stacking the items is the key to fitting it all in. The bag itself is 10.5-inches deep, 15-inches long and 8.5-inches wide. With these dimensions, you can stack a hearty lunch with some room to spare. A helpful feature that’s not always offered with lunch bags is storage ease. This cooler can be collapsed to a certain degree and stored away. If you’re camping or traveling, collapsing the bag when its not in use is a valuable feature. You can make more space in your tent or hotel room when a bulky bag isn’t taking up space. Pull it back open when you’re ready to fill it again. 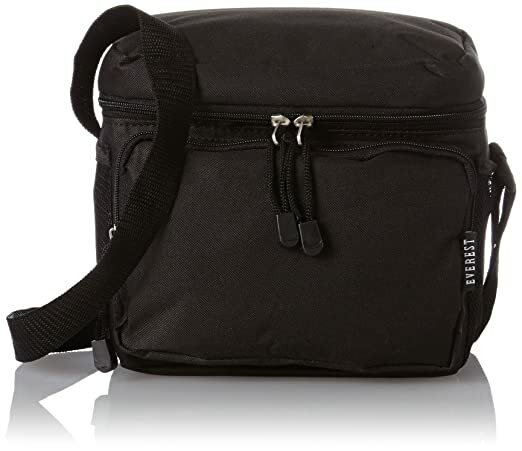 Carry this lunch container on your shoulder, slip it onto your carry-on luggage or hold it like a handbag. Every situation calls for a different carrying option, and eBags makes sure that you’re covered each time. Keep your cooler zipped up tight for those long trips. By replacing your ice several times across many days, you can make your food last for a very long time. Coleman is known for its camping products so it makes sense that this manufacturer would have a lunch-container addition in the marketplace. This product actually has the same design as the larger and more heavy-duty models meant to be hauled out to a beach site as consumers sit on the lid. With a comfortable bail handle, this cooler is perfect for your workday lunch or a trip outdoors. Consider the features offered by this product, and you might want to try it out today. Most personal coolers today have a soft-body design, but Coleman maintains the hard-body shell for a purpose. You can bump and stack this container without any problems, such as when you pack the car for a day trip. The sturdy, plastic construction keeps all of your food and drinks as safe as possible. Plastic also holds the insulation in place as it cools your food. In the end, Coleman simply relies on the tried-and-true construction of traditional coolers to form their FlipLid 6 product. The interior dimensions are about average for a personal food container. 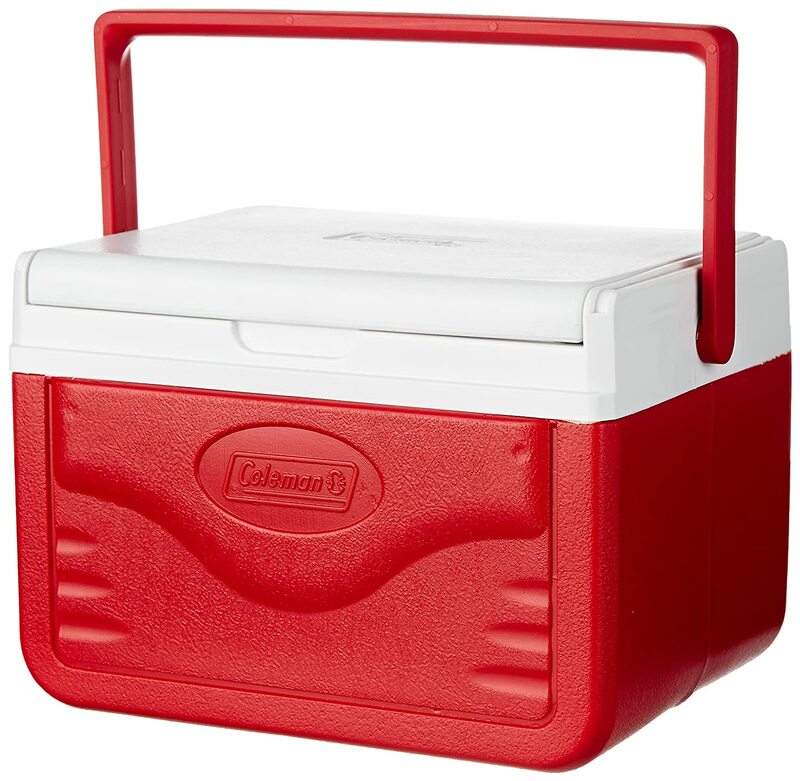 Coleman’s cooler measures 8-inches long, 6-inches wide and 5-inches deep. This space is ample enough to hold your daily lunch and ice for about 5 hours. Consumers report that the product seems to lose its cooling ability after the five-hour mark, however. It might be possible to extend this time period by adding fresh ice or packs. Many consumers use this product as a tailgate accessory. Head out to your local sports game, and use this cooler for all of your drinks. In fact, this container holds up to six cans of soda with a consistent liquid temperature of 60 degrees Fahrenheit. Although the drinks aren’t ice cold, they’re cool enough for most people. The cooler has room enough for almost two pounds of ice along with the drinks too. As you pull out the drinks, use the Coleman product as your serving station. The FlipLid 6 converts into a makeshift table when you turn the lid over. Drink holders will instantly appear on the lid, which allows everyone to rest their soda in a safe position. Whether you’re in a stadium parking lot or a grassy area, this lid convenience is one of the best features of the Coleman design. One drawback to using the flipped lid for long time periods is loss of cooling. The lid isn’t sealed to the cooler’s body when it’s flipped, and consumers have noted that some drinks still in the product become warm. When you flip the lid, press it into the cooler in order to seal all of the edges. You’ll lose some coolness, but it should be minimal at that point. Some consumers have concerns about the hinge being too small for this particular design. As you lift and flip the lid, simply use a gentle motion. You don’t want to jar the product with a lot of force because any parts can break at that point. Take good care of your Coleman product, and it can last for many years. With its low price tag, a long-lasting cooler is great deal. You might look for a basic lunch container at some point, and you certainly don’t want an expensive price point. The solution is easily found in the Cooler Lunch bag by Everest. With a compact shape and several colors to choose from, this bag fits almost any meal needs. Take the bag into work, or munch on snacks as you take a road trip. At less than $15, you might want to buy several bags for the entire family. Discover the best features in this cooler to satisfy all of your hunger needs. The entire container is lined with a vinyl material that’s incredibly strong. Wipe it out if it gets dirty, and you’ll keep the bag in premium shape for each meal. The liner is surrounded by a sturdy and well-insulated polyester exterior. You can also wipe the polyester down whenever necessary too. Keeping the entire cooler clean is the trick to maintain its longevity. Take a look at the front pocket that has a handy zipper. This section isn’t insulated, but it’s still useful for those items that don’t require a cool environment. Place your napkins and utensils in this area so that you can reserve the interior for food and drinks. You’ll always have a napkin handy in case of any messes. One feature that’s slightly exaggerated is the side pockets. The manufacturer describes these pockets as perfect for drinks. However, they’re not really big enough for water bottles or similar containers. Use the side pockets for other needs as an alternative. A cellphone, notepad or other item can easily fit into either of these pockets. The lunch cooler comes with an adjustable strap that’s long enough to hang on your shoulder. For some people, it can fit as a wrap around their chest. Alternatively, place the strap inside the bag if you merely want a basic container sitting on a surface. The strap is easily folded and hidden away for your convenience. Consumers are pleased with the design of the product’s lid. It’s possible to fit tall items in the cooler because the lid has a 1.5-inch clearance. Simply zip the lid around your items, and they’re insulated and secured until lunchtime. Similar products with comparable prices don’t have this helpful feature. As you shop around for your favorite cooler color, be aware that some product choices come with an ice pack. This feature will raise the price of your bag, however, so you’ll need to weigh your choices very carefully. Adding an ice pack to your bag is a quick way to equip yourself with all of the right lunch tools. In the end, your sandwich and drinks will remain cool on even the hottest days. The cool factor within any cooler is dependent upon the insulation type. As a consumer, you won’t see the insulation as you look at different products. You must rely on the manufacturer’s description so that you’ll know the type of insulation being used in that product. Ideally, look for closed-cell insulation designs. These materials are similar to tiny bubbles that form a barrier to heat transfer. This product feature, however, can add some weight to the product. As a second choice, look for open-cell insulation. Your food and drinks will still be cool, but just for a shorter time period. Your lunch container is meant to keep your food cool, but it should also protect it from any contaminants. In reality, your cooler will get dirty over time. You should be able to clean it with ease whenever necessary. For hard-body containers, you simply need to wipe it down with a mild detergent and water. Stains and food particles will be quickly whisked away. Soft-body coolers, in contrast, need a little more elbow grease. Spot clean them or dip the entire bag into a soapy, sink bath. Carefully scrub the materials, and you’ll have a perfectly clean bag once again. Soft-body containers will have seams along the exterior and interior parts where all of the materials meet. The seams are always the most vulnerable to damage as you fill the cooler. In fact, most products fail when these seams are breached. Avoid any coolers with a sewn appearance. Although the stitching might look tough, it will break down quickly. As an alternative, select a product with internally welded seams. The manufacturer uses a specialized welding machine to essentially fuse the materials together. These seams are extremely difficult to break. Always look for a container design that has an ample supply of removable parts. There might be lids, shelves and liners that can be removed. This feature makes it easier for you to clean the product and replace those items if necessary. At the bare minimum, the liner should be removable. You have a chance to wipe out the interior without the liner in the way at that point. Rigid or permanent parts within the cooler only make it more complicated to maintain. If you plan on taking your lunch with you each day, it’s beneficial to have several different containers on hand at all times. Allow one cooler to be cleaned at home as you take another one out on a hiking trip. Ideally, the product should be perfectly clean for each meal. Allowing food particles to remain in the cooler will only contribute to its quick demise. Pick different colors for your product collection too. Those colors might correspond to a family member’s preference or a day of the week. Regardless of your cooler rotation, only use the containers that are in prime shape. A broken container won’t hold its temperature, and your food will suffer as a result.